Most of our party slept in the next day to recover from two long travel days, although John was up early. We had breakfast in the same Canyon Room restaurant we had dined in the previous evening. Then all four of us hopped into my car. 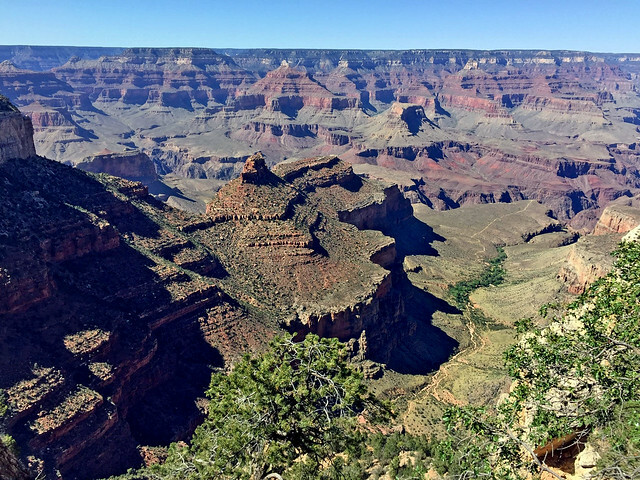 We knew parking was limited at the South Rim of the Grand Canyon, so carpooling made sense, and that also meant we only needed to buy one car pass into the national park. Our first stop, however, was the National Geographic Imax theater. I remembered the exciting and well-made Imax film on the canyon which I’d seen there with my father back in 1991. It turned out they are still showing that same film to this day, even though it was shot back in 1984, when I was just graduating from high school. I was playing tour guide since I’d been to the canyon long ago. I decided we should park the car at the visitor center at Mather Point and then ride shuttle buses to other points on the rim to the west. That way we could take shelter from the wind in the old lodges at Grand Canyon Village. We parked in one of several lots at Mather Point and grabbed a lunch of cold sandwiches. It was an uncomfortably windy outdoor meal, with cool and strong gusts from the north. So we were wearing jackets, and I had my Tilley hat strapped down when we got our first look at the canyon. We had to walk over towards Mather Point, whereas I remembered it being right off the road. The Park Service reworked the area back in 2010. The view was, of course, quite stunning. I remember feeling disoriented upon my first view of the canyon with my father back in 1991, and Wendy had a similar experience upon her first sight of it. She felt dizzy as her mind struggled to interpret the immense chasm, with the North Rim 10 miles away and the canyon bottom a mile below us. The view was literally vertiginous. We exchanged taking couples photographs to celebrate our arrival. It was a Monday afternoon, but the South Rim was busy. There were loads of tourists like us, of various nationalities, all along the rails at Mather Point and points beyond. We made our way out to the point, where Little Kion joined in the fun, trying to act big. Mather Point is now the first view of the canyon for most tourists, and it is fittingly named after Stephen Mather. He was the energetic first director of the Park Service in the early 20th century. He was bipolar, so his manic efforts on behalf of the parks were often followed by nervous breakdowns, but he accomplished much, and he was one of the main advocates for establishing a Grand Canyon National Park. I could see the Isis Temple prominence poking up from the North Rim five miles away, with the line of a trail visible across one of the mesas on our side of the canyon. 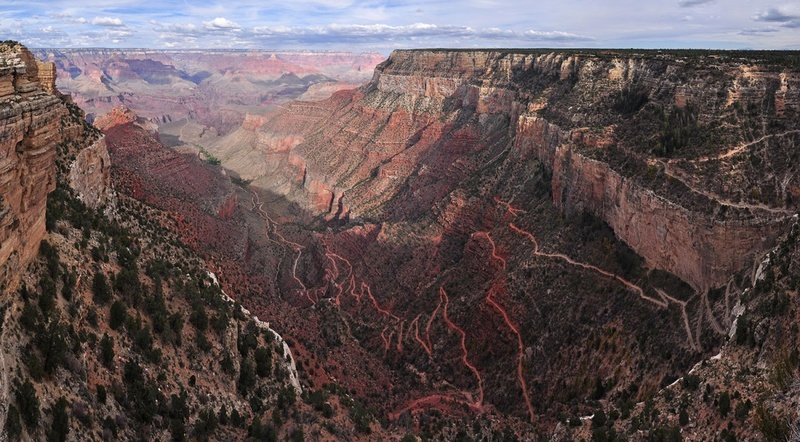 The Park Service photograph at right by Michael Quinn shows the many switchbacks of the Bright Angel Trail, which leads down to the canyon bottom. We boarded a shuttle which took us to the Yavapai Geology Museum. This small facility was built in 1928 and rededicated in 2007 after a renovation. It had a large topographic relief map and a rock layer display. We scanned them, but I think John had the right idea: sit down and enjoy the view. The Temple of Isis was directly across the canyon from there. Our couples again took snapshots of each other outside, and Wendy posed near the rim for me. 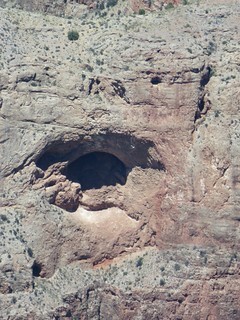 We had all noticed a large cave-like opening in the side of one ridge, and my superzoom camera provided a better look at it. 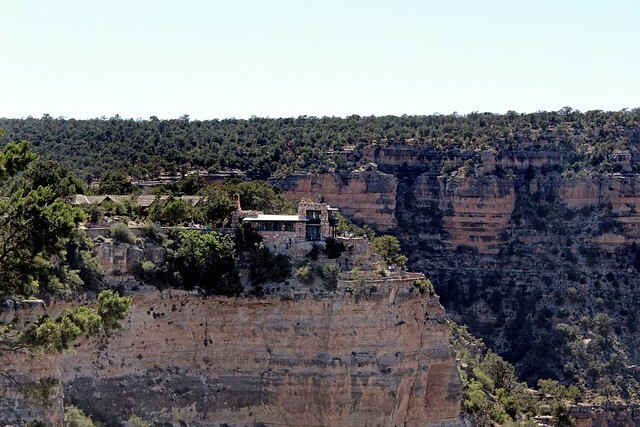 335 of the estimated 1,000 caves in the canyon have been recorded, but only one can be toured. John is quite observant. His sharp eyes spied a bridge across the Colorado far below. I used my superzoom on that as well. It is a 440 foot span that carries hikers and mules 70 feet above the river to Phantom Ranch. Another shuttle bus ride took us to Grand Canyon Village, where there are several lodges. I’d checked on rooms there many months back, but they were all booked up, and the crowds along the rim and in the lodge lobbies made me glad we stayed at the Best Western in Tusayan. 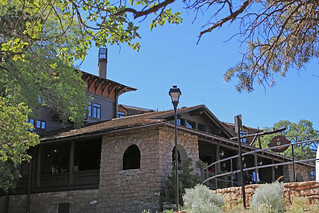 We climbed up from the train depot to visit the lobby and gift shop at the El Tovar Lodge, which was designed by Charles Whittlesey for the Atchison, Topeka, & Santa Fe and opened back in 1905. It has a rather dark lobby, and its exterior was designed as a cross between a Swiss chalet and a Norwegian Villa in a mishmash of styles in the manner popular in that era. I much prefer the more cohesive rustic style of Mary Colter‘s Bright Angel Lodge of 1935. Both hotels were Harvey Houses, with the Bright Angel created as a less expensive alternative to El Tovar. 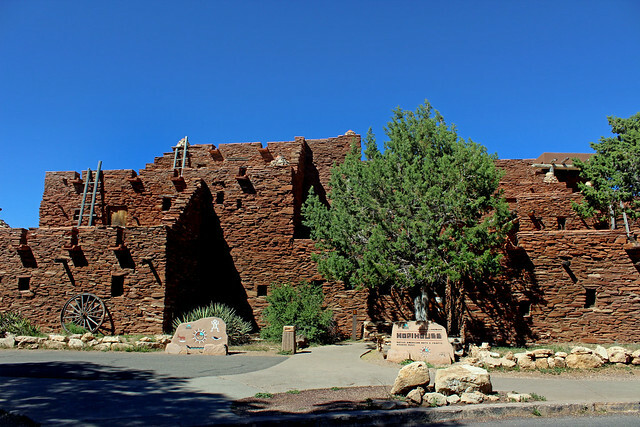 Colter designed many structures along the South Rim, including the Hopi House, which opened in 1905 adjacent to the El Tovar as a gift shop of Native American items, and it still serves that function. It has a striking exterior with its varied windows and intricately stacked stones. The interior is so crowded with tourists and wares that one struggles to make out its architectural details. Along the rim we could see a prominence on our side of the canyon somewhat like the Isis Temple. Below it we could see the Bright Angel Trail following Garden Creek to a grove of trees which mark the Indian Garden campground. John’s sharp eyes picked out buildings down there, confirmed by my superzoom camera. There is a trail leading out across the top of the mesa that dead-ends at the canyon drop; that is a side trail from Bright Angel to Plateau Point and takes hours to hike. From the rim it is difficult to gauge the distances below. 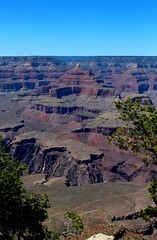 We walked along the Rim Trail for the beautiful views at Grand Canyon Village. The desert air was drying us out, and the water we carried was now warm, so we hoped to find some cool refreshments. Verkamp’s Curios Store from 1905 was still selling items, but not refreshments. 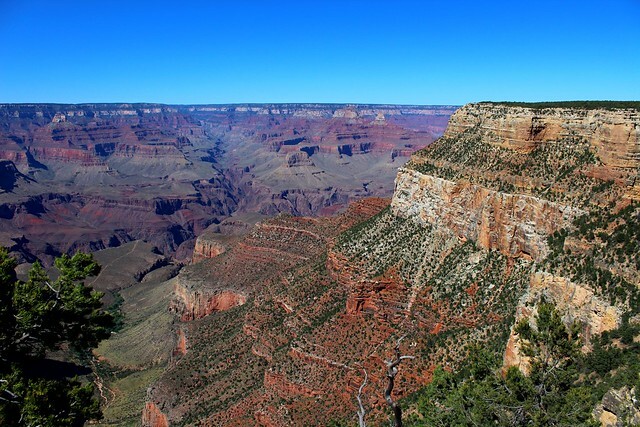 So I led us back west along the Rim Trail, knowing that Bright Angel Lodge would surely offer something. We passed the back side of the El Tovar, which had a bunch of plants growing in protective cages. Farther along the rim we could see Colter’s Lookout Studio perched atop its mountain of rock. I could see tourists on its various levels gazing out into the canyon. We passed the uninspiring Kachina and Thunderbird lodges of the 1960s and, sure enough, found an ice cream stand at the Bright Angel Lodge. After that treat, we toured the Harvey House room in the lodge, which I remembered from my 1991 visit with my father. Outside, we located the Bright Angel Trailhead where hikers and mules make the hours-long trek to the bottom of the canyon. John goes on trail rides with his own mule, but none of us had wanted to book a mule ride down into the canyon. After one last look out at the canyon, we were ready to call it a day. We took the shuttle back to the car and had dinner at the Big E Steakhouse in Tusayan. They had a neat slideshow running on the stage, but I suggest you avoid their mushroom & cream cheese wontons. Our servers kept forgetting to bring them and, when they finally did, I wish they hadn’t. But we enjoyed our steaks. Wendy and I returned to our hotel room to discover we had been left only decorative pillows on the bed, and none of the ones for sleeping. I notified the front desk, and a bellboy delivered some to us. But Wendy noticed they felt damp and one had the odor of someone’s bottom. We made do with the three that were least objectionable, and the next morning she wrote a note to the housekeeper about the problem in both English and Spanish. I included the usual nice tip with it, grateful that my wife knows some Spanish, whereas I only retain a tiny bit of Latin, which is of little use in everyday living. Wendy’s note yielded a sincere apology, written in Spanish, that indicated gratitude for our tips and our bed was outfitted with new pillows for the next night. The pillows were still too squishy, collapsing to a thin layer when you rested your head on them, but at least they were dry and smelled fresh. 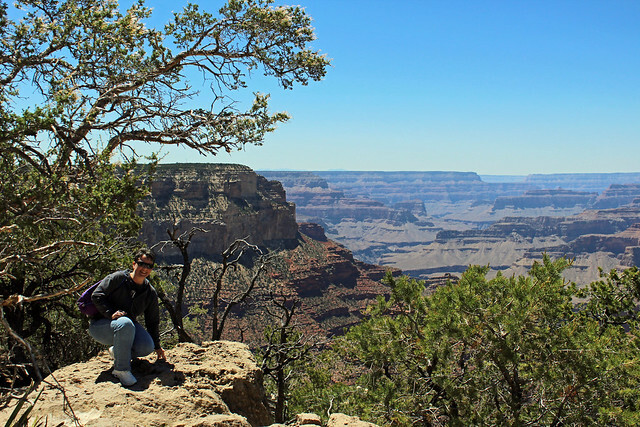 For our second day at the canyon, we got up earlier for a morning drive east along the rim to Desert View, hoping to avoid some of the crowds, and then headed north in the afternoon to see the Navajo Bridge at Marble Canyon. 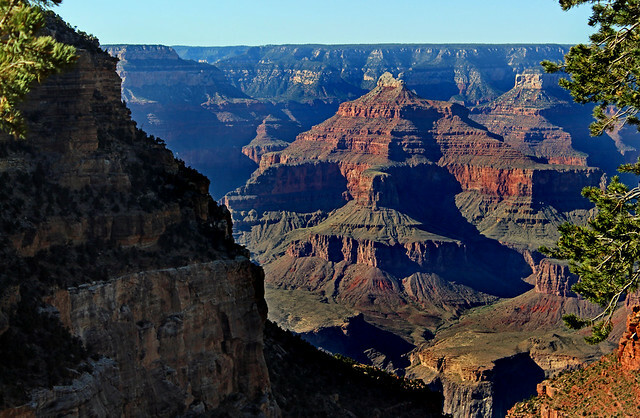 Enjoyed your recent trek to the Grand Canyon. Reminds me of my own travel to the tip of Plateau Point way back in 1981. It was H*O*T down there and a long hike up on the return. Learned then and there a downhill walk at the end of the trail is the best medicine! I’ve never been down in the canyon except a few turns down Bright Angel. I think the climb back out deters me!